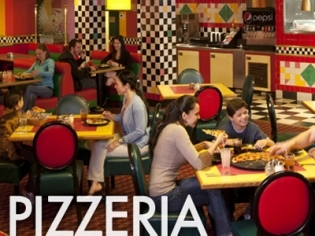 For delicious freshly-baked pizza, Circus Circus offers the Circus Pizzeria. The pizza is made to order with your choice of toppings and served in a fun and exciting atmosphere that is suitable for the whole family. Freshly-made calzones, sandwiches and salads are also available. The Pizzeria has in-room delivery for those staying at the hotel. The crispy crust and gooey cheese on the over-sized portions will have you coming back for more. Try the Pair-a-Dice pizza or the BBQ chicken pizza if you like something a bit different. Fabulous flavor combinations! Eat in, take-out or opt for in-room delivery if you need a break from the casino!